Edmond Chow is an Associate Professor in the School of Computational Science and Engineering in the College of Computing. He previously held positions at D. E. Shaw Research and Lawrence Livermore National Laboratory. 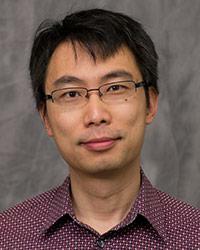 His research is in developing and applying numerical methods and high-performance computing to solve large-scale scientific computing problems and seeks to enable scientists and engineers to solve larger problems more efficiently using physical simulation. Specific interests include numerical linear algebra (preconditioning, multilevel methods, sparse matrix computations) and parallel methods for quantum chemistry, molecular dynamics, and Brownian/Stokesian dynamics. Dr. Chow earned an Honors B.A.Sc. in Systems Design Engineering from the University of Waterloo, Canada, in 1993, and a Ph.D. in Computer Science with a minor in Aerospace Engineering from the University of Minnesota in 1997. Dr. Chow was awarded the 2009 ACM Gordon Bell prize and the 2002 Presidential Early Career Award for Scientists and Engineers (PECASE).